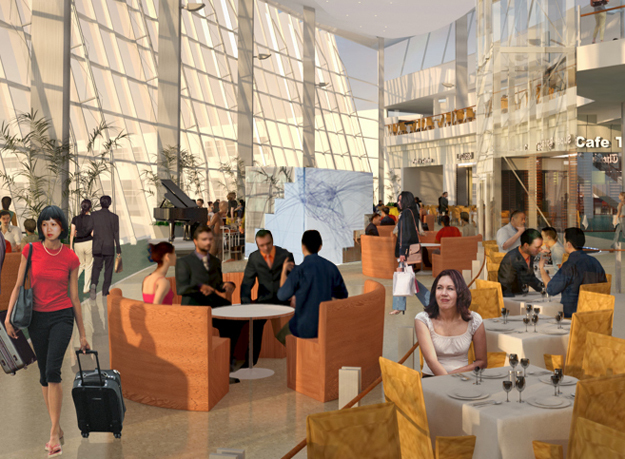 The design for The Cube Theater at the San Diego International Airport has been approved. The challenge of this project is that scheduled performances will occur only a few times a week and the rest of the time it has to hold its own as a sculpture. Our solution is that between performances it will be a 10 foot cube and for performance events The Cube will by mechanical operation and automatic control open into a stage. The closed Cube sculpture will be surfaced with brushed stainless steel panels that will be etched with the sum of global flight lines. Mirror panels will be used at the corners that will lighten The Cube’s presence in the space and turn people’s movements into another type of performance. When Cube is closed, people will be able look through small viewers in the walls to watch video fragments about travel and waiting. When open, The Cube will turn into a small but fully equipped theater environment.